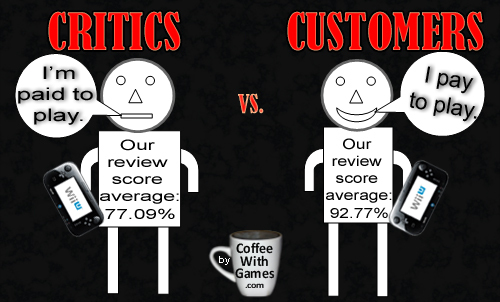 Coffee With Games: Critics vs. Customers! ZombiU reviews, or zombie reviewers? 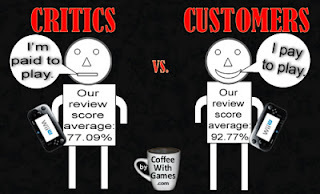 Critics vs. Customers! ZombiU reviews, or zombie reviewers? Do you like zombies? Do you not like zombies? Do you feel like a zombie when you wake up, and generally throughout the day? ZombiU released for (and with) the Wii U on November 18, 2012, basically as a brand new IP. The game was developed and published by Ubisoft, and received an ESRB rating of "MATURE" with "Blood and Gore, Intense Violence, Strong Language" listed as content for gamers and parents to be aware of. It released with a MSRP of $59.99 in the United States, and can be purchased either via a physical retail copy from stores, or a digital "copy" through the Wii U's eShop. With a full month of "professional" critic reviews and customer reviews for ZombiU to look at now, and having completed the game myself, is ZombiU a Wii U title you should play (if, you are of age)? Have Wii U owners agreed with the "professional" reviewers on ZombiU? Brew yourself some coffee, and let's take a look! 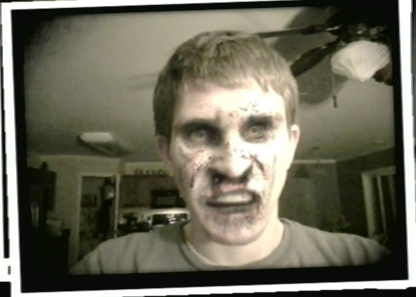 How a zombie smiles, before reading reviews of ZombiU? While reviews for the game were under an embargo, GameSpot "leaked" their ZombiU review in a professional fashion (see: sarcasm) a few days early by publishing it on their site, then removing it. The damage was already done though, and their review score quickly spread around different message boards and video game websites. The first "professional" review scores for ZombiU started being published on November 18th, the day the Wii U launched and the day the ZombiU review embargo was lifted. ZombiU currently has a "professional" review score average of 77.09%, based on 43 reviews on GameRankings.com. Its MetaCritic.com Metascore is currently 77 out of 100, based on 61 critic reviews. What about customers though? What have gamers, perhaps like myself that ignored the early reviews, who have played the game thought about it? ZombiU currently has a review score average of 92.77%, based on 36 customer reviews from Amazon.com. 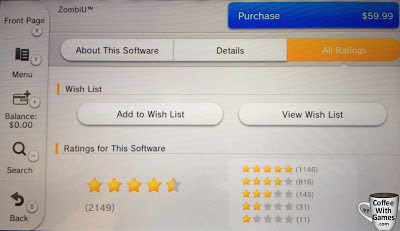 The game had a review score average of 88.43%, based on 2,149 gamer reviews directly from the Wii U's eShop rating. Note: All of the review scores for ZombiU were captured around 4:00PM EST on December 18, 2012. I chose to not read most ZombiU reviews, until I finished the game. I didn't want to see "problems" with the game before playing it for myself, and I was also afraid some of the reviews might have contained spoilers, so I didn't want to read or see anything that might have given something away in the game. One average is a C, one an A, depending on the grading scale. After I completed the game, I decided to read the "reviews" of the game and see what some of the problems were, and what did I discover? Apparently, the problem many early "reviewers" of ZombiU had is they were too busy to finish the game (see: complete it), before slapping a score on it. Apparently, the proper way to "review" games these days is to watch a few trailers, read a few impressions of it, play it for maybe an hour; then decide if you want to go positive or negative in the "review" and stick with it. What "reviews" of ZombiU contain either outright incorrect information, or show the "reviewers" apparently didn't finish the game? Here's my short list, for now. IGN. Nintendo Life. Game Informer. Then there is Game Spot's reviewer, who went into the game knowing (I guess) it is a survival horror title, but thinks it should have been an action game instead? GameSpot's reviewer though, and many others, did seem to like ZombiU's multiplayer options, which Mrs. Coffee and I did try out one evening together. Is the audio synced up correctly? It seems off on YouTube, but right in my player. Feedback? I just don't understand reviews having incorrect information, as two of them above do, and leaving that incorrect information published. Perhaps the sites were taken over by zombies? I contacted both sites with reviews containing incorrect information. One site didn't want to address a larger problem with their "review", and chose to leave incorrect information published; the other site apparently didn't care their "review" contained bad information and has left it published as well. Then, one of the reviewers hasn't answered a simple question about the game that he was asked, "How long did it take you to complete it so I have an idea?" ZombiU gives you that information. The game tells you how many hours (and minutes and seconds) it takes you to finish the game, and how many survivors it takes you to finish the game as well. Kotaku's Stephen Totilo is the only reviewer of ZombiU I am currently aware of that provided the number of hours it took him to complete the game, and the number of survivors it took him to get through it. His review of ZombiU is HERE. My "Playtime" and survivor count. As for myself, I completed ZombiU in 24 hours, 40 minutes, and 10 seconds according to my game's "Playtime", and it took me 34 survivors to complete the game. I have many ex-survivors wandering the streets, sewers, and general areas of London still, so please add my Nintendo Network ID of Coffees to your Wii U friend list if you want more zombies wandering around your ZombiU game. Should you play ZombiU, if you are above the recommended age? I recommend giving the game a try. Whether that is buying it, renting it, or borrowing it from a friend (my copy is currently loaned out right now actually). I think you will enjoy the game if you don't go in expecting a FPS game, or an action game, and understand that the melee combat is designed, I believe, to keep you on your toes. You shouldn't expect to get 100 hit zombie combos in the game, and understand that ammunition for guns is scarce. Many of my hours playing were spent exploring different areas in the game. There are small alternate paths in a few areas that you may miss if you are just running through the game, and sometimes those areas contain weapons and ammunition, and even story pieces. I believe exploration is encouraged in the game. So, based on the review averages for the game so far, I side more with the "customer reviews" averages than the "critic reviews". I think ZombiU is another perfect example of why there should be basic video game review standards on sites, as I have written about in the past. Did any of you perhaps not purchase ZombiU, because of the early reviews on the game? 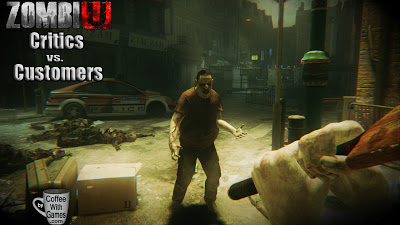 If you have played ZombiU, what do you think about the game? If you have played and beaten ZombiU, how many hours and survivors did it take you? Also, have any of you attempted to beat Survival Mode yet, and possibly completed it? You can purchase ZombiU below from Amazon.com, and find out how long you will survive! Read other Critics vs. Customers pieces here and here. eShop ratings is a horrible way of analysing what consumers think about the game. Because you have to play a game for over an hour to rate it, a huge number of people that didn't like the game will never get the chance to rate it, which will push the average up significantly. 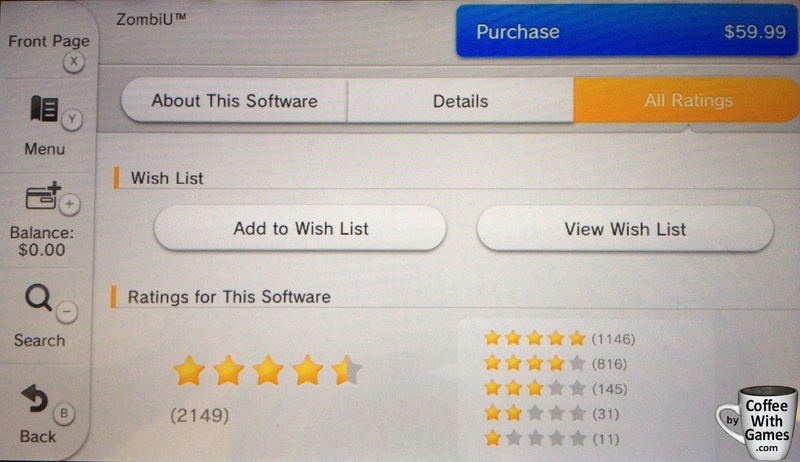 Seriously, are there any eShop games that have more than, say, 100 "reviews" with a score lower than 3.5 stars? Certainly not in Australia. With regards to Amazon and the like, I still maintain that the only time people that submit reviews is when they feel passionately about a game. This either skews things into the 9/10+ area (people love the game, people that don't love the game don't bother to comment), or the 4/10- area (people have a problem with what the developer did - eg Diablo 3 or Dragon Age 2). Beyond that when I do read reader reviews of a game, they very rarely give an articulate analysis of a game. There are some professional critics that don't either (and I certainly have questions about the critics that rated ZombiU down in the 4/10, 6/10 area), but then there are a lot of professional critics that provide game analysis that is superior to any reader review I've ever read. I think the Metacritic average is fair for ZombiU. Not everyone liked the game, for a variety of reasons. And, unlike reader reviews, critics are paid to judge something dispassionately. It's certainly a divisive game! "eShop ratings is a horrible way of analysing what consumers think about the game. Because you have to play a game for over an hour to rate it, a huge number of people that didn't like the game will never get the chance to rate it, which will push the average up significantly." Well, I think the game should be completed before a review score is put on it, so I'm okay with a time limit being met first. If the person only played the game an hour, I wouldn't call that a "review" honestly, and hope they do complete it before scoring it. I don't see any Wii U games with more than 100 reviews having lower than 3.5 stars, but there are a few games with 3.5 stars (or lower) with less than 100 reviews. I don't think the number matters a whole lot on it though, and that is why I provided the eShop and Amazon averages. MetaCritic and GameRankings averages on most games have fewer than 100 review scores averaged, so if more than 100 is your standard, then you can't even use MetaCritic or GameRankings for the majority of games. And MetaCritic has very low standards for having a review "averaged" into the overall average on games. As for Amazon reviews, I have seen (yes, even on this one) better written customer reviews than professional reviews. Again, sites leaving in incorrect information in their reviews, and refusing to take down "reviews" with incorrect information is pretty horrendous. Threatening somebody with a ban if they ask how long reviewers played a game, doesn't exactly scream "professional" to me. "Beyond that when I do read reader reviews of a game, they very rarely give an articulate analysis of a game. There are some professional critics that don't either (and I certainly have questions about the critics that rated ZombiU down in the 4/10, 6/10 area), but then there are a lot of professional critics that provide game analysis that is superior to any reader review I've ever read." "...but then there are a lot of professional critics that provide game analysis that is superior to any reader review I've ever read." I would say there are probably more articulate customer reviews, because of your very point about them being passionate enough to write a review for a game when they aren't paid for it. When sites have no standards, what's stopping a "reviewer" from playing it for a short time and slapping a score on it, just to get a free game and/or get paid? Apparently from what I learned with ZombiU (and other past games), nothing. The sites would be better off taking customer reviews from Amazon.com and using those, or reviews from other sites with customer reviews. I don't really care if somebody reviewed ZombiU a 4.5 out of 10, or an 8 out of 10. If the words in their review don't make sense with the score, and/or their review contains incorrect information, that is my problem. If a site deletes comments that show a reviewer didn't finish the game, there is a problem with that IMO. Being that the industry has had employees from companies get fired/quit over review scores, and say review scores are determined by ad buys, and just outright editing of scores to make publishers happy, I would say some standards would be a good place to start for the industry if its trying to be taken seriously, and more importantly, honestly. Again, I like saying that if I read a book or movie review, I can assume the reviewer finished the book or movie unless stated otherwise. Unfortunately, that is not the case with video game reviews. It is the exception, not the rule from what I can tell. As for being a divisive game, I really do hope that it ends up being more than a one release game, and can become a series....of sorts. Not yearly, but a sequel in 2 years would be nice. Maybe by then I will have completed Survival Mode. Matt, then again, if a consumer did not even put an hour into the software they paid for, should they be submitting a review in the first place? They certainly have the right but I feel their under-1-hour impressions may be rather half-baked! I tend to agree about 'beating' a game before reviewing it, which is why my reviews tend not to be among the 'first wave' of those that come out. That being said, you can usually get a good idea of a game with at least several hours put into it. Oh, I agree. I'm not suggesting that people who have played the game for less than a hour should be voting their thoughts on a game. But that doesn't change the fact that the people that genuinely do not enjoy a game are not likely to play it long enough to vote on it, let alone finish it for a balanced opinion on the game. Therefore the scores in the two eShops are hopelessly skewed beyond usefulness - all you're seeing is the votes of people that liked the game. I bought ZombiU at launch and it was and still is my favorite launch game for the Wii U. I still play it in fact trying to improve my score. "That being said, you can usually get a good idea of a game with at least several hours put into it." You can for sure, but you also miss out on certain things in the game if you only skim it...apparently skimming isn't just done with internet articles, but also with playing games for reviews! I would say on games like ZombiU, that have a clear start/finish, it should be finished...or specified in the review that it wasn't and how far the person made it. Apparently though, if you ask a "reviewer" if they finished the game on certain sites, you might be banned for that (or, banned, then unbanned, then threatened with another ban if you ask questions on reviews....?). "But that doesn't change the fact that the people that genuinely do not enjoy a game are not likely to play it long enough to vote on it, let alone finish it for a balanced opinion on the game." Well, I would say eShop has better standards than the majority of sites as for putting a score on a game. At least they have a requirement...of playing the game for an hour...before allowing a score on it. If somebody starts a game, and can't play it for an hour, I would imagine if they REALLY hated it they could simply leave it running for 55 minutes (assuming they played it for 5 minutes), then start the system back up and rate it. "Therefore the scores in the two eShops are hopelessly skewed beyond usefulness - all you're seeing is the votes of people that liked the game." I don't think so, and there are games with not perfect scores, or scores that high. We know the eShop ratings played it for an hour, which is more than we know GameInformer's or IGN's "reviewers" played it. If all we're seeing is people that liked the game, it should be a 5 out of 5 star rating above 90% at the very least. But, it had 187 3 stars, or lower, ratings as of yesterday. Again, when I see sites/magazines like IGN, GameInformer, and NintendoLife publishing "reviews" that contain either incorrect information, and/or their reviewers can't answer basic questions because the sites have no review standards themselves, that is what I would call "skewed". Have you attempted Survival Mode yet? I was playing ZombiU before I read the reviews as well, so when I read them they also baffled me. I loved the game, and while I understand a Survival Horror game is niche and cannot be loved by many people, this is no excuse for giving them game low scores and blaming it for not doing things it's not supposed to do. It makes me wonder whether they would have hoped to see "more shooting" in the Lord of the Rings movies, and given them a low score for that. At any rate, I'm glad you take the time to gather review information not just from metacritic and gamerankings, but Amazon reviews and now MiiVerse as well. I recall you doing this with the data we used to have on the Wii as well, which I also admired. I think MiiVerse is definitely going to be a great tool for bringing to light otherwise underrated or overlooked gems, thanks to the great community there. I'll give a game more then an hour before I put it down. I'll put a good four or five into it at least. otherwise it's a waste of money. Well, apparently it seems that sites don't care (or find necessary I guess) for a game with a single-player focus, to be finished. Again, if I read a movie review or book review, I expect to know if the reviewer didn't finish the book/movie. I think it's honest to play the entire game, and respectful to the developers/publishers, and even readers of the game/review to play it until the credits roll. I don't understand why sites can't/won't provide basic information provided to the "reviewers" by the game, such as hours played and the number of survivors it took them to finish. That would give readers a good idea of what they can expect for their $60 going into it I think. "It makes me wonder whether they would have hoped to see "more shooting" in the Lord of the Rings movies, and given them a low score for that." Good analogy. In one review, the "reviewer" complained about a certain action in the game, but failed to mention that the game has a better default control option for that same action. To me, that's like he went to a restaurant, ordered a salad, then ate it with his hands and complained it was a mess, because he didn't know how to use (or just didn't use) the fork sitting on the plate with the salad. If the restaurant (developer) provided him with a better solution to eat (or play), it's not their fault he didn't know how to use it, or that it was even an option he failed to see/use. Apparently in this situation, because he didn't play the game very long from what I can tell, or he would have discovered the alternate method pretty quickly. Again, he complained about one action in the game that has two control methods, and FAILED to mention what I think is the better (easier) control for the action. That is complaining to complain, IMO. Thanks for the comment and feedback! BTW, did you finish ZombiU? I originally passed on ZombiU because of reviews, but my brother convinced me to buy it. So happy I did, one of my favourite games I've ever played. Yes I would love if there was a little more melle variety, but I think the point is to keep you from just killing everything in the game easily. The immersion and atmosphere in this game is incredible. "Yes I would love if there was a little more melle variety, but I think the point is to keep you from just killing everything in the game easily." Yeah, I think the melee was designed to make it where you can't be careless...at all really. If you get careless with even one zombie, it could be the quick end of that survivor. I think perhaps a few different finishing melee moves could change it up nicely, and I wonder if they experimented with more of them before the game shipped, but decided to hold off on them. Disqus ate my comment, so I'll keep it short. How did you like the mote/chuck FPS controls as compared to something like 007? Seemed like the cursor was moving, but it didn't affect your direction. For me I'd rather control more of that with a stick and just focus on aiming with the mote. I didn't check to even see if the "bounding box" could be adjusted the night we played, and I was just learning the controls in the multiplayer using the Wii Remote and Nunchuk. So, what you saw was the game has a LARGE bounding box, and it requires move pointing to the FAR outside edges to turn, but that might be able to be changed...can't check it right now though, as my copy is across the street. I can't really compare it to 007, or other Wii FPS games as I didn't try and adjust the controls and we didn't play long that night. As for Disqus eating comments...hopefully that isn't Disqus' New Year's resolution..."Eat more comments." "Practice my comment vanishing act." Thanks for the comment and questions, and if I find out about the controls, I'll try and remember to comment back here with the update! Great point about reviewers not finishing games before giving games a rating. It's just odd, if they don't finish, why not just simply answer the question or state that they didn't? I'm glad I skipped the reviews until after I played it, but I'm not glad to see sites provide bad/incorrect information in their "reviews" because they apparently didn't finish the game. I really don't understand "reviewers" like @spacekappa and @timturi that won't answer simple tweets that asked them how many hours it took them to finish it, but they will block someone for apparently asking those type of questions? I hadn't seen this reply until now! I did finish Zombi U, it was a lot of fun. It's one of those games that don't come very often. Haha! I lose track of comments quite often, so I understand how it can be. I agree though, I don't think ZombiU type games come very often...and this one we might not have gotten had it not been for a new console, with a new controller. I'm just glad Ubisoft allowed it to happen, and I really do hope it ends up doing really well for them. I know this post is a little dated but I feel very strongly about the entire ZombiU affair. I bought a WiiU at launch and downloaded a digital copy of ZombiU as soon as I had unwrapped the packaging. Like you, I had not bothered reading the reviews until I had played it (rule of thumb for me). I got in a little over my head by beginning the game on Survival mode. Although I have spent the last 6 months renovating my new (old) house, the previous 6 months had been spent playing an hour here and there and I have yet to complete the game. I've progressed past collecting the Panacea about 3 times over (and various points in between at least a hundred times over) and I've enjoyed every minute of it and have zero regret about not playing through in Normal mode first. I've never felt such true suspense and panic in a game than when accidentally stumbling into a room that you cannot escape with three extremely aggressive zombies (the doc and two SWAT zombies) and having nothing but a bat, a med kit and an empty slot equipped. Reaching each save point earns you a true dose of relief and accomplishment and a chance to wipe the sweat off your palms. I cannot recommend this game enough. As you said, the critics were unjustly harsh. "Boring and humdrum" fights with zombies and the "inconvenience" of having to manage your BOB while the game plays out on the screen -- that's the whole point! And now, the game sells so poorly that Ubisoft has cancelled a planned sequel. A real travesty all thanks to "professional" reviews... Obviously, I'm upset. "I've never felt such true suspense and panic in a game..."
I really, really, really would like to see Nintendo work something out with Ubisoft to keep ZombiU going on the Wii U, but I don't think that's going to happen right now unfortunately. Nintendo of Europe (NoE) had the ZombiU bundle at launch, and advertised it. The U.S. is supposed to be the most important region for Nintendo's home console sales though, and not only did NoA not have the ZombiU bundle at launch, but they didn't advertise it in any fashion at all after they released it. What show is one of the most popular in the U.S.? The Walking Dead. Just seems like it was a missed opportunity to me when the system launched last year. I have wanted to go back again and try to beat it on Survival for a while, but haven't attempted it since earlier this year. Also, feel free to add my NNID to your friend list, Coffees, if you're wanting some caffeinated zombies wandering around your game. Yeah, The Walking Dead did have the game from Activision, and while that might be one reason for not having a TV ad in the U.S. on the show, the fact is NoA didn't produce a single internet, TV, or even promotional trailer for it/the bundle. They could have run the ad on Hulu Plus (which, people use to watch The Walking Dead). Or, they could have used an internet campaign (for CHEAP) where people that searched "The Walking Dead" saw results for a video, or a text link like, "Become the walking dead in this Wii U exclusive game". They didn't do anything though. Mentioned it in the middle of a Nintendo Direct (preaching to the choir), and nothing else. On the $15 well spent, I agree. It was a day one purchase for me (at $60), and when I saw that sale I sent it to you, @Chalgyr, and even GoNintendo (though, it was never posted there...for some odd reason). They really do need to get beyond Nintendo Directs. They're great for people like us and I look forward to some of them, but they need a real campaign for both games and the Wii U. ...and keep the deals coming. Speaking of Nintendo Directs, there should be one here in another few short hours! I may go back and find a specific spot to watch, but I can't remember the last one I actually watched all the way through. If I wasn't busy working on a side project right now, I would probably be posting up "Coffee Shop" posts on a daily basis. But trying to program this thing, and design non-block looking people, has been quite fun these last several months. Will be interesting to see what the direct is all about. Sounds like software schedule thru august 2014. I may have watched e3 and one before that all the way through, but only pieces of others. Usually I'll just read the highlights on GoNintendo. Wondered what you were working on. Bought it @ launch but couldn't get into it at that time strangely. Just bought it again in the sale and completed it in less than a week. it's like a dark souls light with zombies, it's fantastic and it has become one of my favourite games now. it took me 15 hours and i think 18 survivors on normal mode. didn't really use walkthroughs, only looked up one dee letter location because i just couldn't find it and couldn't wait to go on with the story. i loved the story btw. just right for a game like this. long cutscenes just wouldn't work for a game like this. game is so underrated - it's a crime. really really sad. will definitely play this one again on survival mode- really looking forward to that. i will also buy a retail copy again to support it....even jf that's not helping much. i really love my wiiu but i would marry it if there would be more games like this. Awesome game. Takes time to get it. Play it all the time. Reviewers don't get it...I think if it were available on platforms other than WiiU that tends to skew young and probably not the ideal target audience for the game, things would be different for this title. The reviews were woeful and put the lie to their claims of wanting interesting I.p. this game is close to perfect. Best zombie action since re 4. The small issues it has are outweighed by how involving and interesting an experience it is. This is what the Wii u platform is for. It doesn't skew young, it doesn't skew at all which is the point. It is for everybody, young and old, male or female. Thank you for a mature game Ubisoft. Its a rare thing for such a focused uncompromising game to be made by big developers! Overconfidence gets me. Every. Single. Time! I haven't played Dark Souls myself, but have heard the comparison to ZombiU quite often. Glad you were able to give it another try though, and enjoyed it. Thanks for the comment and feedback! Sorry it took me 2 weeks to respond! When you say "Play it all the time. ", are you meaning the single player campaign over-and-over again, or the local multiplayer as well? The one thing about Ubisoft that's interesting is that they were at the launch of the Wii with an original IP with Red Steel and the launch of their incredible Rabbids series. I'm glad to see them trying new IPs on Nintendo's systems, I just wish Nintendo would see that and make some effort(s) to help advertise their games in the U.S. The single player campaign. Local multiplayer is good, but often don't have a partner for that, and there's not much suspense in that. Campaign can be repetitive but you can spice it up with challenges - time, using or not using certain types of weapons. Have really grown to love the crossbow over time, all in all my favorite. Just wish there were more neighborhoods, worlds to explore but looks like this is it for ZU.